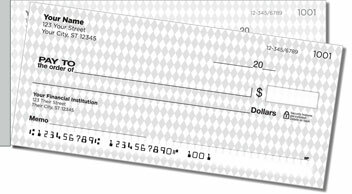 Here's a sophisticated set of personal checks sporting the ever-popular Harlequin diamond motif, rendered here in a diminutive scale using a subtle shade of silver. This timeless style will be right at home in your purse or pocketbook, thanks to its light, neutral color and classic geometric pattern. You'll also appreciate these side-tear checks for the ease with which they separate from the pad. It's due to the short line of perforation on the left, which improves leverage for a quick, clean tear. That means you'll waste fewer checks due to accidental rips, making them a fabulous value. There's no good reason to delay -- order your very own Silver Diamond Side Tear Checks today!